We believe children should receive an annual eye exam to ensure early detection and effective treatment. Regular eye exams can help to diagnose vision problems as well as rule out other rare causes of defective vision such as retinal diseases. Eighty percent of all learning in a child’s first 12 years is through the visual system. And experts say that as many as 25% of students have undiagnosed vision problems that may affect his/her educational performance. Many children think the vision they have is normal without realizing they have vision problems. Often teachers are the first ones to observe that a child does not see well. All too often, parents and educators rely on the Snellen (Big E) chart to screen school age children for vision problems. Yet, at best, the Snellen chart can detect only 20 to 30 percent of vision problems. WHAT VISION SYMPTOMS INDICATE A NEED FOR AN EYE EXAMINATION? 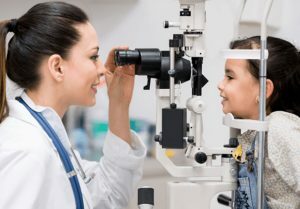 Depending on your child’s age, an exam at IEC will likely include testing vision and eye alignment, as well as evaluating medical history and general eye health. The doctor may use a symbol chart, 3-D glasses coupled with a dot chart, and/or a retinoscopy test to observe how the retina reflects.